With Beaver Themer out in the wild and 2.0 almost ready to launch, we've been thinking a lot about what to do next. With that in mind, we could really use your help. I know, surveys are a bit of a drag but I promise we made this one super easy. There are only about seven questions and all but one are multiple choice. It can be completed in just a couple of minutes. Helping us get a better understanding of who you are and what your business looks like will enable us to build better products and features. Take the super-short Beaver Builder 2017 user survey. A few months back, we set up a Beaver Builder subreddit. Since Facebook threads tend to come and go pretty quickly, our hope is that Reddit could be a better place for long-term discussions. With that thought in mind, we started up two resource threads on Reddit and we're going to do our best to keep them up to date. First, there is a thread of all the Beaver Themer resources—both ours and others. There are videos, tutorials, articles, podcasts, etc. If we're missing anything, please leave us a comment and we'll get anything relevant added on there. Next, we have a thread with sites that have been built with Beaver Themer. As I write this, there is one site on there, but we'll add more as we learn about them. Again, please leave us a comment if you have a Beaver Themer project you'd like to share. Beaver Builder 2.0 is coming—and soon! In 2.0, we're overhauling and improving Page Builder's UI/UX and adding a bunch of new features and enhancements. Along with the visual refresh, we're adding more keyboard shortcuts, a preview mode, module search, and a bunch of other goodies. The plan is to release an alpha version of 2.0 in two weeks. 2.0 is going to bring big changes, but not breaking changes. It will be completely backward compatible. Keep an eye peeled for a post on Facebook and Twitter with the Alpha announcement and a release blog post not long after. A couple months back, we started doing a section in the blog to highlight folks from our community or from our team. This month, I really want to give some kudos to a few folks from our support and development teams. 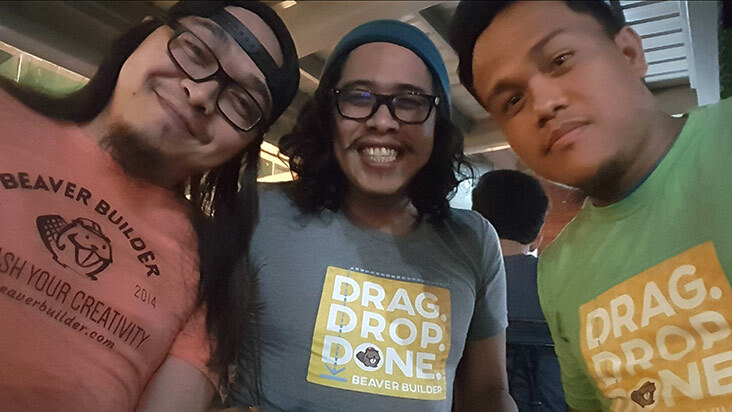 Meet Ben, Jun, and Eugene sporting their ever-stylish Beaver Builder Swag! These guys, along with Carlos who is not in the picture, represent our Philippines-based Beaver Builder squad. I wanted to highlight the hard work these guys—and all of our support team—puts in in light of our Beaver Themer launch this month. To be frank, Beaver Themer was a lot more popular than we anticipated and our support got slammed with pre-sales questions and feedback. The whole team stepped it up a notch and ensured we were able to answer everyone's questions in a timely manner. Nice work, guys! Story time – Do you remember your first job? A year or so ago, we got a very well-written email from a young man who asked if we could help him set up a website for his high school's robotics club. They needed a website, they were on a shoe-string budget, and after researching options he decided that using WordPress and a Page Builder would be the most flexible and future-proof option. Smart kid, eh? I should mention, we offer a standing 10% discount for anyone using BB for educational purposes. You just need to ask. We decided to go the extra mile and “sponsor” the robotics club and provide them with a free license. As you can expect, shortly after starting to use BB I had a lot of questions. Most of them I look back on and say “duh everybody knows that”, but anyways, that led me to find the “best source for info on quick BB questions”, which consequently led me to the Unofficial/Official Slack Channel. Well, one day on the slack channel I was posed a question something along the lines of “Hey you wanna earn some extra money?” Well, as you can expect, at the time this poor 18 year old's answer was “Hell Yeah!” (Well, not exactly like that, but definitely the idea…) So ~10 months later I'm still working for the same person as a Freelance web developer/designer using BB (among a bunch of other awesome products) every day, making 3.3x minimum wage, but most importantly, loving every minute of it and learning soooooo much! All in less than a year all because I found BeaverBuilder! BB has essentially launched me into my first real job making real money, and a career I had no idea would be soooooooo easy to get into. How about that!? Congrats to Jonathan for landing an awesome gig and thanks for letting us share your story. Justin and I are heading out to WordCamp Orange County next week. Will you be there? We'd love to link up. There's a great WordPress scene down in Southern California and I hear one of our favorite YouTube personalities is making an appearance! The GeneratePress Theme has been getting a lot of attention and accolades recently. It's one of the themes that fully supports Beaver Themer and it's free. Our buddy Eric Hamm created a nifty plugin called the GeneratePress Extender. Similar to his Genesis Extender plugin for the Genesis Framework, it gives you an interface to style and customize the theme. Pods makes it super easy to create custom content types and custom fields in WordPress. Beaver Themer makes it super easy to create layouts for custom content types, so naturally, the combo is like two peas in a pod (har har). But really, our friend Bernhard aka Quasel created a very slick integration plugin to make working with Beaver Themer and Pods easier. Thanks, Quasel! We recorded some really fun podcasts to help drum up some attention for Themer. Instead of linking them all here, they're all listed on our Beaver Themer resources page on Reddit. If you've heard us on podcasts before, you've probably heard the story of how we picked the name Beaver Builder and how we're a distributed company. This time, we told a bunch of new stories! Okay, I think that about does it. Thanks again for taking a second to check out our survey and thanks, as always, for your support and reading through our posts. That PODS integration is terrific! It prompted me to finally learn the PODS system. Agreed! Hopefully, we’ll have more features and tips for using BB/BT and Pods in the future. Hello! Is it better than Custom Post types + ACF? I would it call different, deeper, and in some parts simpler as you get a dropdown filterd based on current CPT with all fields registered with pods – but it always depends on the use case. Great update! So much awesome going on! I will take this opportunity to say a special thanks to Ben Carlo. BeaverBuilder is great and all, but Ben is the reason I am still around. From my early days (years ago), he showed great patience with me and always went above and beyond. He’s one of the few support people anywhere I will always go out of my way to thank and will never forget. Just heading over to do the survey, Robby. As usual, this month’s newsletter is full of good stuff. Now that I’m back in the web design biz and using Beaver Builder every day again, I’m constantly scratching my head on how much easier everything is since discovering you guys all those years ago. I love everything you guys are doing and can’t wait for v2.0 to come out. By the way, one of my friends “Doug Belchamber” just released his new WPD Beaver Popups plugin into the WP Repo. It’s an excellent add-on for BB users looking for a slick popup creator. Will catch up with you soon, mate! Completely redesigning our web site using Beaver Themer this summer. Looking forward to seeing BB version 2.0. Left/right sidebar for editing properties of selected object… pleaseeeee !!! Any date for release of 2.0? Sorry, no release date yet. I used it but there is a problem I mean when I save my page it updates very late, any solution? Hey! Whats’s happened to June update? Please keep us informed at this exciting time for BB! Earth to BeaverBuilder, do you me read me? Number one rule “Never stop communicating”. Second rule, “Bad news is better than no news” Looking for an update. Loud and clear! 🙂 Update is coming very soon. Apologies for the delay. Any news on the release on 2.0?